Tom Cruise might be insane. And I'm not talking about the "couch-jumping scientologist" brand of insane, I mean that if Mission: Impossible - Fallout is any indication, I'm not entirely sure that the man has any regard for life and limb. Cruise has become known for personally performing death-defying stunts without a double in the Mission: Impossible films, and he once again outdoes himself in the series' sixth entry, Fallout, which finds him skydiving and dangling from helicopters as he seeks to save the world from a nuclear holocaust. The film deals directly with the, ahem, fallout from the last film, Rogue Nation, bringing back international terrorist Solomon Lane (Sean Harris) as the catalyst for a plot to bring down the global world order and reshape society as we know it. 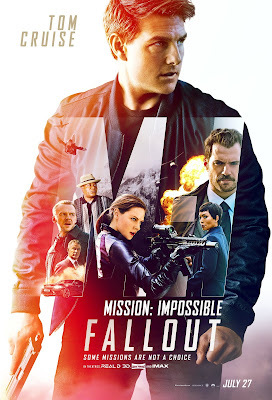 The splintered remnants of Lane's group, now known as The Apostles, intends to obtain stolen Russian plutonium in order to detonate two nuclear weapons at unknown locations, and Ethan Hunt (Cruise) is called in to stop him. This time, however, he is joined by CIA operative, August Walker (Henry Cavill), who is assigned to keep an eye on him after a mission goes wrong. As they get closer to their target, however, the lines between who is a friend and who is a foe become increasingly blurred, and it isn't long before no one can be trusted. Fallout marks the second film in the series directed by Christopher McQuarrie, who is now the only filmmaker to helm more than one Mission: Impossible film. Yet it is clear that he and Cruise work well together, and in continuing the story from Rogue Nation, it allows both actor and filmmaker to deepen the story they started in 2015. And what a story it is - the amount of sustained tension that McQuarrie is able to create is stunning, just when you think that the film must be reaching its climax, it hits you with yet another escalation, and it does so without sacrificing pacing or character. McQuarrie, along with cinematographer Rob Hardy (Annihilation), allow the camera to explore the space within the frame in spectacular ways, each shot and each cut seemingly precision crafted for maximum suspense. Cruise's stunt work is also every bit as jaw-dropping as advertised, and it adds a level of authenticity to the film that sets Fallout apart from the over reliance on CGI that plagues much of its action movie brethren. It is Cruise's dedication, and McQuarrie's sharp eye for visual storytelling, that make the film such a resounding success. For a franchise that is now 22 years old and on its 6th film (with a seemingly ageless action star now approaching 60), Mission: Impossible is showing no signs of slowing down or slipping into irrelevance. This is top-tier action filmmaking, the kind of no-holds-barred, balls-to-the-wall extravaganza that manages to root its spectacle in actual human emotion, justifying its excesses by fully committing to their high stakes. We've come along way since the more cerebral spy movie roots of Brian De Palma's original Mission: Impossible (1996), but McQuarrie and Cruise have continued to build upon a successful formula in ways that deliver real summer movie thrills that prove you don't have to sacrifice soul to keep an audience on the edge of its seat. 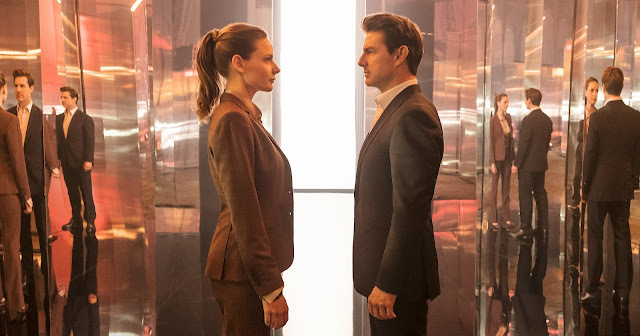 MISSION: IMPOSSIBLE - FALLOUT | Directed by Christopher McQuarrie | Stars Tom Cruise, Henry Cavill, Simon Pegg, Ving Rhames, Rebecca Ferguson, Sean Harris, Alec Baldwin, Angela Bassett, Vanessa Kirby, Frederick Schmidt, Kristoffer Joner, Michelle Monaghan, Wes Bentley | Rated PG-13 for violence and intense sequences of action, and for brief strong language | Now playing in theaters everywhere.